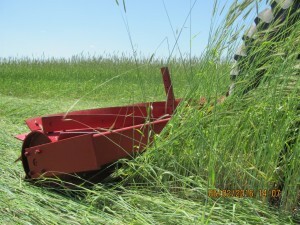 A roller-crimper built by high school students made its debut in the 2016 growing season. The roller was built with slight variations to the one designed by Jeff Moyer of the Rodale Institute. I had been looking for ways to integrate more cover crops into my crop and livestock operation and decided that it was necessary to find winter annuals that would survive South Dakota winters. Multi-species cover crops following small grains and full season cover crops for livestock grazing had been used for several years, but there were gaps in the late fall and early spring with no living cover. To change this, I took to the fields following corn harvest in the fall of 2015 with winter cereal rye. I seeded the rye with a JD 750 no-till drill in mid-late October at a rate of 80 pounds per acre. That winter, my senior welding students began construction of the roller crimper and the project took approximately 3 ½ months to complete. The spring of 2016 was extremely wet in southeastern South Dakota and my area received 25 inches of rain between April 1st and May 30th. Our yearly average is 26 inches of rain. Fields with the cereal rye cover handled the excessive moisture extremely well and there was no erosion or standing water anywhere! 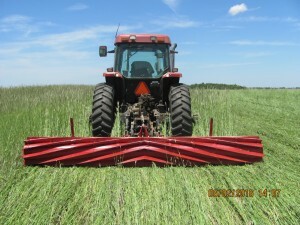 The cereal rye was rolled in early June when it was well into anthesis and soybeans were drilled immediately following rolling at a rate of 150,000 seeds per acre. 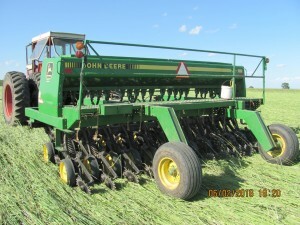 Rolling and drilling were completed in two separate operations since I do not have a tractor with a front three point. Termination of the rye was very successful with approximately 90% termination. Additional weight to the roller-crimper and higher rye seeding rates could have ensured 100% termination. Weeds were not an issue and no herbicides were used to control weeds in the soybeans during the growing season. Many neighboring fields had herbicide resistant waterhemp and even multiple spray passes failed to control the tough weeds. People spent in excess of $100 per acre trying to control the waterhemp chemically and one of my neighbors had a weed pulling crew estimate that it would cost $1000 per acre to pull the weeds. It’s amazing how keeping the ground covered and protected will prevent weed germination from taking place! The soybeans that I planted into the cereal rye are shorter than those not planted into a rye cover crop. I think the differences in height can be attributed to a nitrogen immobilization caused by the high C:N ratio of the rye residue. In addition to this, several years pass between when soybeans are planted in each field. An inoculant would have been beneficial to ensure proper nodulation. It should be noted that even though the beans are shorter, the stems are loaded with pods and I think yields will be similar to the taller soybeans. Mark Misar operates a diversified crop and livestock operation in southeastern South Dakota. In addition to farming, Mark also teaches animal science, plant science, natural resources, agriculture business, and welding at a nearby high school. Mark has B.S. degree in Agronomy from South Dakota State University. For questions pertaining to this article, please contact the author. Shade Avoidance: Can We Breed for Weed Resistance?